Strength training at home rather than in the studio offers many advantages and really only a few disadvantages. Your own home is the perfect place to build muscles and to train effectively. 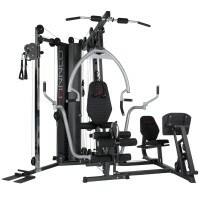 A one-time purchase provides you with the complete equipment you need. So now no more excuses like „no time“ or „it’s too far away“. Having your own multi gym at home means training when you want to and not having to drive to the gym. This can be particularly attractive before or after work avoiding extra trips through the city after a tiring day at work. 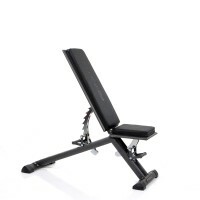 There is no need to have dozens of fitness tools to do an effective strength training at home. 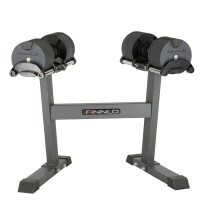 A space-saving multi gym or a dumbbell station with dumbbells and barbells is absolutely sufficient to do all the necessary exercises for a quick and visible muscle building. At home you do not only train whenever you want, but you also wear what you like: the obligatory dress code in the gym does not apply. You can just train in your favourite outfit – even in your boxer shorts. Furthermore, annoying waiting times and the re-adjusting of the fitness equipment are a thing of the past. The equipment in your home studio which is set-up to your liking and remains adjusted correctly to how you need it. Your muscle training workout can be accompanied with your own favourite music. When the workout is done, your shower and your comfortable sofa or bed is waiting for you just a few steps away. For whom is strength training at home suitable? An effective muscle training and building can be done perfectly at home. Why get stuck in traffic, just to reach the next gym? Isn’t it better to spend that time at home with a tough workout which does not have to last that long to be very effective indeed? Twice or three times a week, half an hour is perfectly sufficient to train all big muscles groups of the body. The possibilities to build muscles in a healthy and effective way are nearly unlimited. 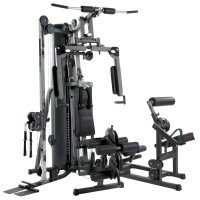 Free weights, fitness tools, multi gyms or your own body weight: muscle training can be done in many ways. Guided movements with a multi gym are also suitable for beginners as there is not really that much that you can do wrong. The only people who should really avoid strength training are very young children and other with cardio-vascular problems (Ask your doctor when in any doubt). Young people can start muscle building if they wish, but should not train too hard as they are still in their growth phase. A multi gym combines various machines in one and requires only a small space what makes it perfectly suited for strength training at home. Strong arms and shoulders, a six-pack and a trained back or defined legs and a well-toned buttock – your home gym makes it all possible! 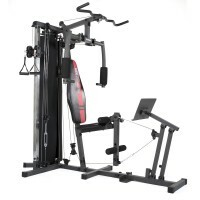 Latissimus, bench press, a leg press, butterfly, triceps cable, biceps, curlpult, chin up bar and cable cross can all be accomplished with a single machine. 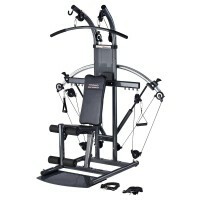 Especially for beginners, the multi gym is perfect due to the guided movements. Advanced and professional users have also the possibility to use the free exercises on the machine to train with higher intensity utilizing isolated movements. Very motivated users are able to use the gym in combination with additional dumbbells and kettlebells to get an even wider range of exercises. There are many possibilities to do strength training at home. Finally, it always depends on the available space, the financial means and the training goals of the individual. However, pay attention to the old saying: „Buy cheap, buy twice“. The quality has to be right so that you can enjoy your multi gym for a long time. Set a high value on manufacturing, material, stability, quality and the cushions. 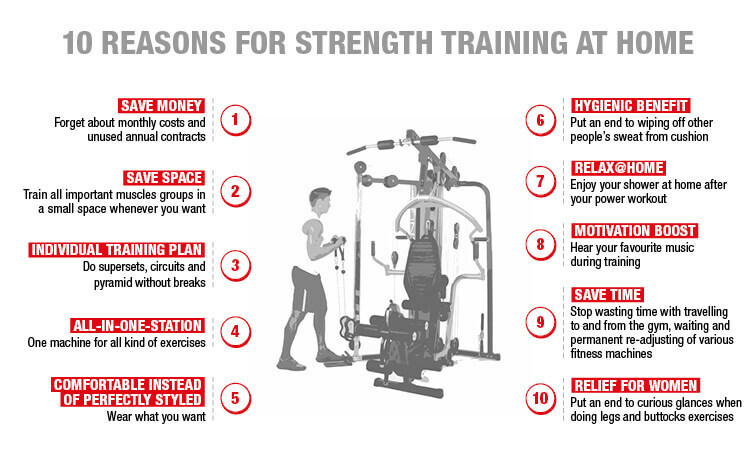 Strength training at home is not only effective but provides many further advantages. Once invested, you can train your muscles as much as you want at any time you want.